Being a LGBT ex-Muslim from the Islamic world is an extremely difficult life. Our good friend Anas Zakiri wanted to escape persecution by going to Europe where he can be with his boyfriend in Scotland. His journey has taken him from Morocco to Turkey where he is trying to get into non-Islamic Europe where he will be safe from persecution. Unfortunately Anas's journey has been fraught with danger. He has been repeatedly attacked and robbed for being a bi ex-Muslim. He has found work but his job barely pays him enough to have sufficient food in addition to recovering from the relentless attacks that he faces. The funds raised will go to Anas to help him buy food and cover other expenses as he attempts to get into Europe under political asylum. Anas is no longer in Istanbul. He is current in Izmir getting ready to cross into Europe where he can be free to be a bisexual ex-Muslim without facing relentless persecution for his beliefs and his sexuality. The journey will be dangerous as with any sea crossing. I sent Anas an additional $250 at the last minute to make sure he has what he needs to make the trip safely and to have a good life jacket just in case his boat capsizes. Once in Greece, he will be taken to a refugee camp. We will try to get him away from the refugee camp as soon as possible as these camps are often times made up people who might beat him to death if they find out that he left Islam and is going to Europe be with his boyfriend Kris. Wish him luck on his journey. There is still more work to be done as we need to raise additional fund for Anas in Greece so that he can be safely away from the refugee camp where he would still face threats of violence. At least now he is well on his journey to be free to criticize Islam and express his sexuality without threats of violence. The GoFundMe has raised $1,220 to date with a goal of $1,500. All money has been sent to Anas. The goal will be raised to $2,500 so that an additional $1,280 can be raised for Anas. This is the bare minimum needed to ensure that he has some cushion for several months while he tries to rebuild his life in Europe. Any additional money raised over the current goal will greatly help his quality of life. Thank you to all who have helped Anas so far. His journey would not be possible without you. An update on Anas Zakiri’s situation: Anas is no longer in Istanbul. He is current in Izmir getting ready to cross into Europe where he can be free to be a bisexual ex-Muslim without facing relentless persecution for his beliefs and his sexuality. The journey will be dangerous as with any sea crossing. I sent Anas an additional $250 at the last minute to make sure he has what he needs to make the trip safely and to have a good life jacket just in case his boat capsizes. Once in Greece, he will be taken to a refugee camp. We will try to get him away from the refugee camp as soon as possible as these camps are often times made up people who might beat him to death if they find out that he left Islam and is going to Europe be with his boyfriend Kris. Wish him luck on his journey. There is still more work to be done as we need to raise additional fund for Anas in Greece so that he can be safely away from the refugee camp where he would still face threats of violence. At least now he is well on his journey to be free to criticize Islam and express his sexuality without threats of violence. The GoFundMe has raised $1,220 to date with a goal of $1,500. All money has been sent to Anas. The goal will be raised to $2,500 so that an additional $1280 can be raised for Anas. This is the bare minimum needed to ensure that he has some cushion for several months while he tries to rebuild his life in Europe. Any additional money raised over the current goal will greatly help his quality of life. Thank you to all who have helped Anas so far. His journey would not be possible without you. Anas would like to thank everyone that has donated so far. All $645, minus fees, raised to date has been sent to Anas. 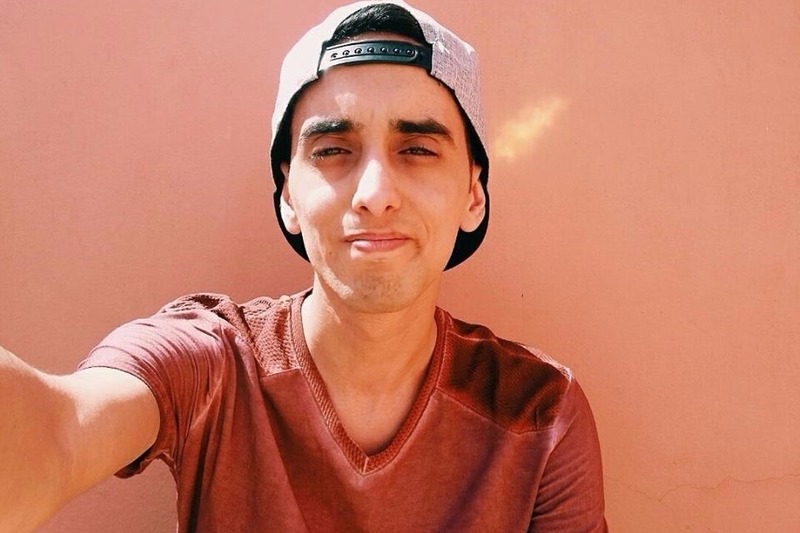 The money has gone towards replacing what was stolen from Anas when his roommates at the first hostel he was staying at robbed him and attacked him when they found out that he is a bisexual ex-Muslim trying to get to his boyfriend in Scotland. That money is allowing Anas to eat more than 1 or 2 meals per day. The remainder of the money he has put aside for his plan to apply for asylum in Europe. After looking over the various options, Anas has realized that it will be difficult for him to enter the UK. The tourist visa requires that he have a significant amount in savings. From reading on the forums he would need at the minimum $15,000 in his bank account for several months in addition to all the application fees. Some people needed even a larger amount of money in their bank account before entering the UK. This isn’t very realistic for Anas at the moment. His goal is to first try to get somewhere where he will be safer. His situation in Turkey isn’t good because homophobia and ex-Muslim phobia are very rampant there, this is why he plans on taking a step-by-step approach to getting to Aberdeen. Anas believes that the best and easiest option for him to try first is to go to Greece. He has a friend in Greece that is willing to help him. From Greece, Anas will evaluate all of his available options to get to the UK. In the mean time, we will have to raise additional funds to cover those expenses. The goal of the GoFundMe has been raised to cover these expenses. There are also additional ways to help Anas. 1) If you are able to host Anas in a higher wage EU country such as Germany, France, Italy, Spain, etc. that would go a long way towards helping Anas. He would be able to apply for a tourist visa in those countries and then apply for political asylum. Having a person willing to host him would make it easier for him to meet the requirements for a visa. It will also provide him a place to stay while he awaits the decision of his political asylum application. It will also make it easier for his boyfriend to come and visit him. They would be able to demonstrate their case for a marriage visa in the UK. 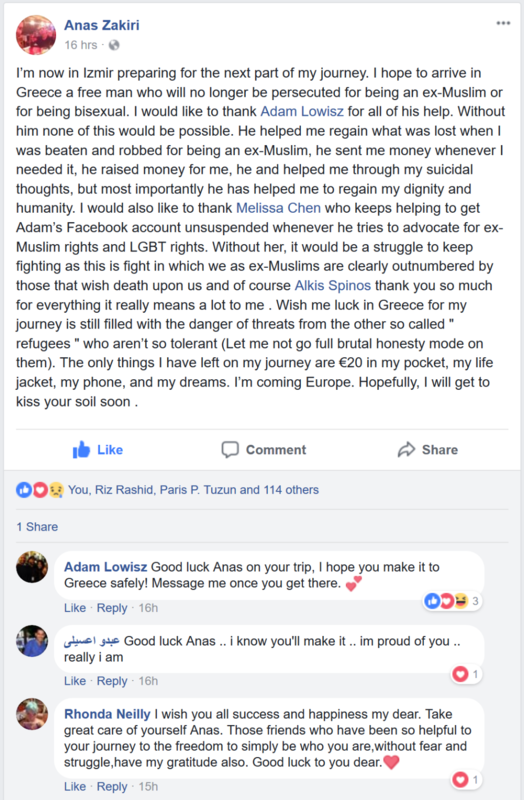 2) If you have a contact in Istanbul, Turkey that can get Anas either a free safe place to stay and/or a better job while he prepares for his journey to the EU that would greatly help him. His current job at the hostel barely pays him enough to survive on. He is treated like a slave and he is being paid slave like wages for the 12-16 hour days that he has to work. The extra money that was sent to him from this GoFundMe is what is allowing him to be able to survive. Getting him a free place to stay and/or a better job that also treats him better would greatly alleviate his suffering until he is able to leave for the EU.